I have played soccer for as long as I can remember. As cliche as it sounds, I have had a ball at my feet since I could stand up. My dad would take me to the park and we'd play for hours. He taught me the basic fundamentals. When I was 5, I attended an Alan Kennedy Soccer School near Liverpool and was spotted by a scout from Everton. It was a dream come true. I played for Everton until I was 9, winning several tournaments, and playing alongside future professionals such as Jack Rodwell, Jose Baxter and John Rooney, and being coached by some of the highest regarded coaches in Great Britain. At 9, due to my 'lack of physical presence', I was released by Everton, and moved to Crewe Alexandra, famous for its youth development. Again, I played on a successful team alongside future professionals, coached by ex-professionals, and first team manager Dario Gradi. Admittedly, after a few years at Crewe, I dipped in form, and couldn't get going again partly due to playing a role I wasn't familiar with, and at 14, I was released and left for Stockport County. At Stockport, I made an immediate impact, playing above my age, which included playing for the Alliance Cup winning Youth Team while still in high school. At 16, I signed a 2 year YTS contract. I started most games in my first year, and was called up to the reserve team on several occasions. I also trained with the first team a number of times as well. At the end of my first year, Craig Madden, the Youth Team coach told me he was really happy with my progess, and that I was well on target to earning a professional contract. My 2nd year as a YTS was to be very important. In the pre-season of 2008, I tore my cartilage. Unaware of the true extent of the damage, I played a couple of exhibition games over the next couple of weeks which aggravated the injury. I had surgery, and was out for 6 weeks. After rehab, I came back into training, but just 4 games later, I still had persistent swelling on my knee. Long story short, I had to have surgery again, and I ended up missing 90% of the season. Therefore, my chances of a professional contract were all but shattered. I was loaned out to Burscough, a semi professional club, at the end of the season, but knee problems persisted and I only managed one substitute appearance. As I had expected, Stockport 'could not afford to take a risk on me' due to their financial situation at the time, and I started investigating ways to carry on playing soccer. Burscough FC offered me a contract, but I stalled on the offer while I considered my options. In the mean time, I was contacted by a number of colleges in the US. The University of Charleston was one of them. It was a great way to continue playing, in a country that I'd always dreamed of living in, and also a chance to continue my education if my professional dreams were not realized. So here I am. I have had 3 major setbacks as a player, which have only served to make me more determined to succeed, and prove those who felt I wasn't big enough, or worth the risk, wrong. I feel as though I am approaching my last chance to make it as a professional player. I am fully confident in my ability to play at the highest level, and I am willing to make the sacrifices to get there. With one year remaining in college, this next 12 months is absolutely critical. All my previous awards seem somewhat irrelevant now, and I am focused on having the best possible senior year I can. 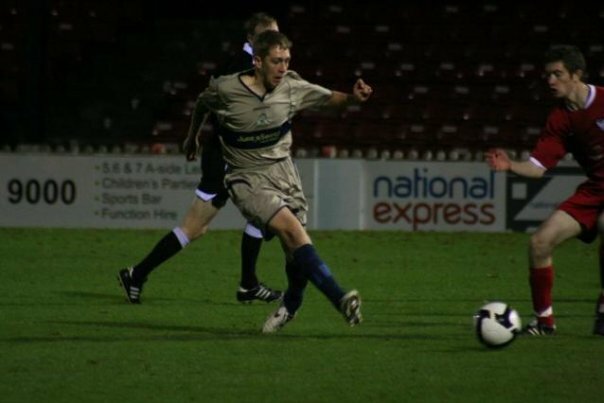 Playing for Stockport County U18's in the FA Youth Cup away at York City. This was one of the first times I had played a competitive game in a stadium. We won 3-2.